1. What are human settlements? Is a habitat comprising of manmade and natural environment in which man lives works, raises his family and seeks his physical spiritual and intellectual well being. 2. What is a Habitat? 3. What is the difference between Urban Area and Rural Area? The definitions adopted are as per the census of India. c.	A density of population of at least 400 persons per sq km. In addition, some areas falling in the vicinity of city or town are also considered as urban area if they are treated as the out growths (OGs) of the main urban unit. Such OGs are shown as urban agglomerations. As per the census definition, Urban Agglomeration is a continuous urban spread constituting a town and its adjoining urban outgrowths (OGs) or two or more physical contiguous town together and any adjoining urban out growths of such towns. The basic unit for rural areas is revenue village, which has definite surveyed boundaries. The revenue village may comprise several hamlets, but the entire village has been treated as one unit .In un-surveyed areas like settlements within forest areas, each habitation area with locally recognized boundaries within each forest range officer's area was treated as one unit. 4. What is Municipal Corporation, municipality, Nagar panchayat? What is their role in human settlements? •	Nagar Panchayat (Notified Area Council, City Council). These municipal bodies of India are vested with a long list of functions broadly relate to public health, welfare, regulatory functions, public safety, public infrastructure works, and development activities that includes town planning activities. 5. What is the role of a development authority? In some cities a separate authority apart from the municipal body is authorized for the town planning activities. This authority is in charge of preparation of development plans, land acquisition, housing, urban landscape, conservation of ecology, etc. e.g: Delhi Development Authority, Banglore Development Authority, Mumbai Metropolitan Region Development Authority, etc. 6. What is an Eco- Sensitive Area? •	significant damage to the natural processes of evolution and speciation. 7. What can I construct in an Eco- sensitive area? 8. What is an SEZ? SEZ’s are designated areas in countries that possess special economic regulations that are different from other areas in the same country. 9. What is a CRZ? Coastal Regulation Zone, abbreviated to CRZ, refers to the coastal stretches of India and the water area up to its territorial water limit, excluding the islands of Andaman and Nicobar and Lakshadweep and the marine areas surrounding these islands up to its territorial limit where the setting up and expansion of any industry, operations or processes and manufacture or handling or storage or disposal of hazardous substances is prohibited. The coastal stretches of seas, bays, estuaries, creeks, rivers and backwaters which are influenced by tidal action (in the landward side) upto 500 metres from the High Tide Line (HTL) and the land between the Low Tide Line (LTL) and the HTL is declared as Coastal Regulation Zone. The High Tide Line means the line on the land upto which the highest water line reaches during the spring tide. The High Tide Line shall be demarcated uniformly in all parts of the country by the demarcating authority or authorities so authorised by the Central Government. 10. What can I construct in CRZ? 11. What are the objectives of the Coastal Regulation Zone Notiﬁcation, 2011? 12. What is brownfield development? 'Brownfield' land is an area of land or premises that has been previously used, but has subsequently become vacant, derelict or contaminated. Brownfield sites typically require preparatory regenerative work before any new development goes ahead, and can also be partly occupied. Development on such land is called brownfield development. 13. What is green field development? Greenfield development is the creation of planned communities on previously undeveloped land. This land may be rural, agricultural or unused areas on the outskirts of urban areas. Greenfield development is about efficient urban planning that aims to provide practical, affordable and sustainable living spaces for growing urban populations. The planning takes future growth and development into account as well as seeks to avoid the various infrastructure issues that plague existing urban areas. 14. What do you mean by zero carbon cities? A zero-carbon city runs entirely on renewable energy; it has no carbon footprint and will not cause harm to the planet. Sadly, most cities throughout the world produce energy by burning coal, oil and gas, unintentionally emitting carbon. Almost every activity humans do involves burning one of these fossil fuels. Initially madsar city in Abu Dhabi aimed to be a sustainable zero-carbon car-free city. 15. What are Gray and Green Infrastructure? Gray infrastructure refers to traditional practices for storm water management and wastewater treatment, using pipes and sewers, & conventional treatment systems including energy-intensive water treatment systems and processes such as membranes and reverse osmosis. Green infrastructure refers to sustainable pollution reducing practices such as Bio-filtration, ponds, wetlands, rain gardens and other natural land and plant based ecological treatment systems and processes that also provide other ecosystem services. 1. Which are the organizations that rate buildings in India? IGBC – Indian Green Building Council and Griha – Green Rating for Integrated Habitat Assessment, are the major organizations that play a key role in green building rating. 2. What are the benefits of Green buildings? 3. What are the rating systems under IGBC? a.	IGBC Green Existing Buildings (Operations & Maintenance) Rating System – for all non residential buildings which has been functional atleast for one year. c.	IGBC Green Townships Rating System - designed to address large developments and it is mandatory to include residential development as part of the township. d.	IGBC Green SEZ Rating System - to facilitate the creation of energy efficient, water efficient, healthy, comfortable and environmentally friendly SEZ. e.	IGBC Green Factory Building rating system - facilitate the development of green factories. f.	IGBC Green Landscape Rating System - primarily for new landscapes, it is also applicable for existing landscapes. 4. What is Pre-certification in IGBC rating system? Pre-certification is a unique aspect of the LEED India Core and Shell Rating system. Pre-certification is IGBC's formal recognition of project intent to built green. Projects aspiring for LEED India Core and Shell rating can apply for pre-certification immediately after finalizing their design & specifications. Precertification is granted to projects on review of the early design stage documentation. This documentation, which reflects a realistic set of project goals and intentions, forms the basis for an award of Pre-certification. Pre-certification specifies the anticipated level of rating for the proposed green features. Pre-certification provides the core and shell owner/developer to market his green project to potential tenants and financiers highlighting its tangible and intangible benefits. Upon Pre-certification, the project is expected to report progress of the project to IGBC every six months till the building is commissioned completely and occupied. This reporting is essential to extend the validity of the pre-certification. The pre-certification cost is a onetime payment submitted along with the pre-certification documents. 5. Should the project be fully commissioned to obtain IGBC certification? Yes the project has to be commissioned to receive certification. Commissioning verifies that the building systems installed match the Basis of Design requirements and deliver desired performance. This would be physically audited by IGBC during certification process. 6. what are the thresholds for different rating levels under lGBC Green Homes rating systems? 7. What is GRIHA rating? GRIHA, an acronym for Green Rating for Integrated Habitat Assessment, is the national rating system for green building in India. GRIHA has been conceived by TERI and developed jointly with the Ministry of New and Renewable Energy, Government of India. It is a green building 'design evaluation system', and is suitable for all kinds of buildings in different climatic zones of the country. 8. What are the thresholds for different rating levels under GRIHA? 9. At what stage can the project be registered for GRIHA rating? The recommended time for registering the project with GRIHA is during the design stage, however projects which are in the beginning of the construction stage can also register, in case they can demonstrate compliance with all mandatory GRIHA criteria. 10. Can a GRIHA rating be applied for an already build structures? No, GRIHA in its current version is applicable for new constructions only. 1. What is Environmental Clearance? Environmental impact notification dated 14th September 2006, which was further amended in 2009 issued under the Environmental Protection Act 1986, has made it mandatory to obtain environmental clearance for scheduled development projects. The notification has classified projects under two categories ‘A’ & ‘B’. Building Construction, townships and area development projects fall under Category B unless any of the special conditions are applicable. 2. When do I have to take an Environmental clearance for my building? & for projects > 1,50,000sqm as per schedule 8b (EIA required for a study period of 3 months). 3. Do I have to take an Environmental Clearance for a township development? Environmental clearance has to be sought for township development if the total area of the project site is > 50 ha and or builtup area > 1,50,000sqm as per schedule 8b. 4. Where should I apply for an Environmental Clearance? At the counters assigned within the respective state pollution control boards. 5. Does the granted Environmental Clearance have a validity period? The Environmental Clearance granted is valid for a period of 5 years. If construction is not completed within this period, the validity has to be extended by applying in the prescribed format. 6. Do the projects require Post Environmental Clearance monitoring? All projects granted with Environmental Clearance should submit a half yearly compliance report in respect to the terms and conditions specified in the clearance document, on or before 1st June and 1st December of each calendar year. 7.	Who is eligible to prepare an EIA document for construction sector? 1. To which areas are the notification of fly ash 1999 later amended in 2009 applicable? The fly ash notification 1999, further amended in 2009 is applicable to all construction projects which lie within 100km of any coal or lignite based thermal power plant for projects undertaken by central, state, & local government, & private agencies. 2. 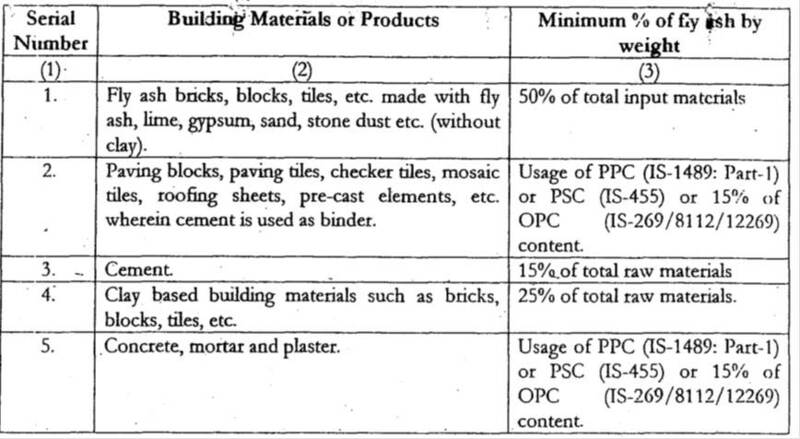 What is the minimum ash content required to qualify as fly ash products? 3. What is National Building Code? It is a comprehensive building code for regulating the building construction activities across the country which came with the contribution of around 400 experts. The Energy Conservation Building Code (ECBC) was launched by Ministry of Power, Government of India in May 2007, as a first step towards promoting energy efficiency in the building sector. The ECBC was developed by an Expert Committee, set up by India’s Bureau of Energy Efficiency, with support and guidance from United States Agency for International Development (USAID). •	Water heating and pumping systems, including requirements for solar hot-water systems. 5. When should my building comply with the ECBC? The code is mandatory for commercial buildings or building complexes that have a connected load of 500 kW or greater or a contract demand of 600 kVA or greater. The code is also applicable to all buildings with a conditioned floor area of 1,000 m2 (10,000 ft2) or greater. 6. To which building systems are the ECBC code applicable? (e) Electrical power and motors. 7. Which building or building systems are exempted from the ECBC code? c.	Multi-family buildings of three or fewer stories above grade, and single-family buildings. 1. Which are the basic norms to be followed for fire safety in buildings? 2. What is a high rise building? What are the special features to be provided for fire safety in high rise buildings as per the National building code? As per the definition given in part 3 of NBC, a building with height more than 60m from ground level is considered as high rise. For such buildings as per the norms given in part 4 of NBC, a provision for a helipad has to be provided.